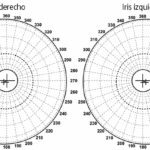 Iridology is based around the interpretation of the surface of the iris and its behaviour. 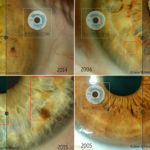 Alterations of the iris tissue adopt shapes with different characteristics that we define as “iridian signs” or “marks”. Suitably interpreting this language of signs makes it possible to obtain very valuable information about the state of health, recovery ability and predispositions to disorders. 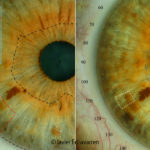 The different types of changes on the iris stroma, the shapes that they acquire, variations to the pigmentation and the behaviour of the iris define the different types of signs. You can see several of them below. 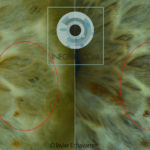 Photo 1: Concentric Circles or Nervous Rings. Photo 4: Flakes. On crown no.7 forming part of the “Circular String” or so-called “Lymphatic Rosary”. Photo 7: Radiuses of different sizes and origins. Some begin at the pupil, others at the collar and we can also observe some without support. Interpretation of the type of sign, its shape, size, location and all of its characteristics is what gives us information about why the signs have developed with those characteristics on the iris. 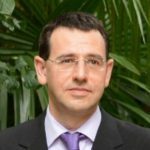 There are other important factors to take into account for a correct assessment, for example, the phase that the signs are at and their relationship with others. – Chapter 10: Iridian and Pupillary Signs (Pages 103 to 136). 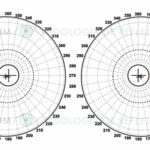 – Chapter 11: Basic foundations for carrying out a diagnosis of the iris (Page 137 to 167). – Chapter 12: Representativity of the signs (Page168 to 170). 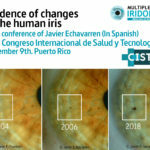 Next conference: Evidence of changes in the human iris.